Stride by Stride: Happy Spring! I know, I know, sheep are not horses. All the two animals share in common are four legs. Still I can't help but want to share this silly image that brings a smile to my face. It is Spring after all and they sure do look pretty. 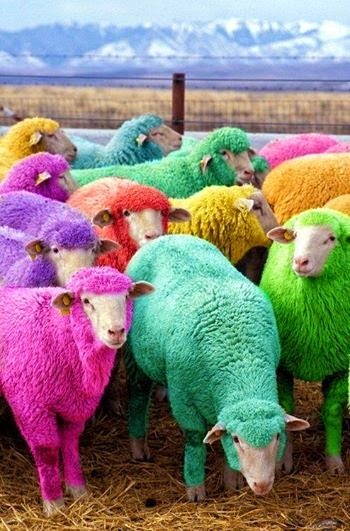 Thanks, sheep for all the upcoming colorful sweaters the next time you are sheared. Animals...they always seem to know just the right way to make a girl feel good. And if you're wondering how and why these lovely creatures are dyed, fear not! The dye is non-toxic. The same farmer apparently dyes his herd every year to entertain motorists as they zip past his farm. Another great reason to visit Bathgate, Scotland. Thanks also to berlin-artparasites for the awesome photo.